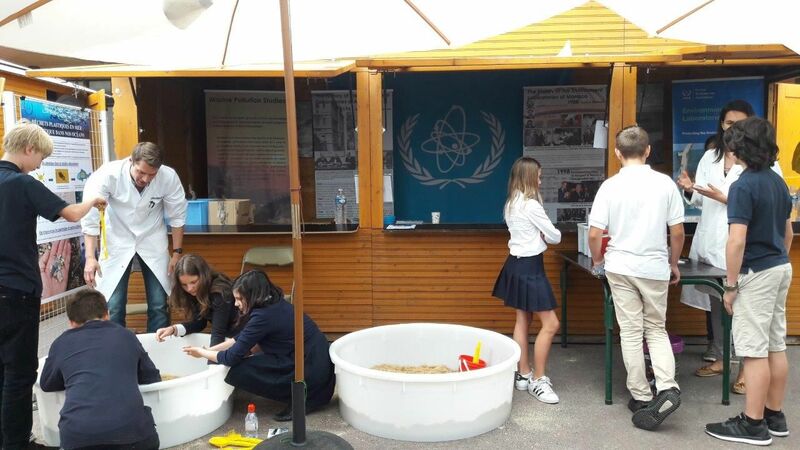 The IAEA’s Environment Laboratories participated in Monacology, the Monaco ecology week, to raise awareness on environmental issues amongst children. From 13 to 17 June, the IAEA had a booth on the theme of Pollution in the Oceans that highlighted some of the issues related to plastics in the oceans. Approximately 1350 children of all ages learned about the processes where plastics break down into microplastics and how pollutants attach themselves to these plastics, ultimately accumulating in the oceans. Microplastics, which are up to 5mm in size, can be mistaken for plankton and eaten by aquatic organisms, making their way up the food chain and potentially threatening seafood safety. “It is important for us to participate in such outreach projects. Children are very receptive when it comes to learning about the environment they live in” said David Osborn, Director of the Environment Laboratories, adding “these children are the next-generation of scientists and decision-makers”. One of the goals of Monacology is to show children ways they can contribute to sustainable development in their daily lives. Plastics have emerged as a serious environmental issue in recent years. They are largely present in coastal and marine waters because of their environmental persistence. Some estimates place as many as 5.25 trillion plastic particles weighing a total of 250,000 tons floating in the world’s oceans. Micro-plastics originate from the weathering and disintegration of larger plastic debris, from pellets used in the manufacturing of plastics, from additives in cleaning and personal care products, and from synthetic clothing. Due to their small size, they can be ingested by marine animals, including bivalves (mussels, clams) and fish. Persistent organic pollutants, such as polychlorinated biphenyls (PCBs), used in coolants, hydraulic oils and paints, and polycyclic aromatic hydrocarbons (PAHs) from industrial activities such as the extraction of fossil fuels, mining and combustion, tend to accumulate on microplastics in seawater with concentration factors of up to 1,000,000. The IAEA Environment Laboratories can use radiolabelled tracers to understand how microplastics get contaminated by organic pollutants and follow their transfer to marine organisms. The Environment Laboratories, which are based in Monaco and Seibersdorf, Austria, use nuclear, isotopic and related techniques to understand the environmental impacts of contaminants, climate change, destruction of habitat and loss of biodiversity, and to propose mitigation strategies and tools. They use stable isotopes to study pollution processes and fingerprint pollution sources to assist with the implementation of remediation activities. The laboratories also maintain seawater aquaria where they can modify parameters like temperature, salinity and seawater chemistry, to simulate climate change and study individual species’ reactions to changes in their environment. This type of information can help countries anticipate future impacts caused by climate variations. HSH Prince Albert showed his support for the event and met the Monacology participants. It is organized with the support of Monaco's Directorate of National Education, Youth and Sports and is held every year. This year, visitors could also participate in experiments with seawater, learning about density and how to make a zinc-air battery.